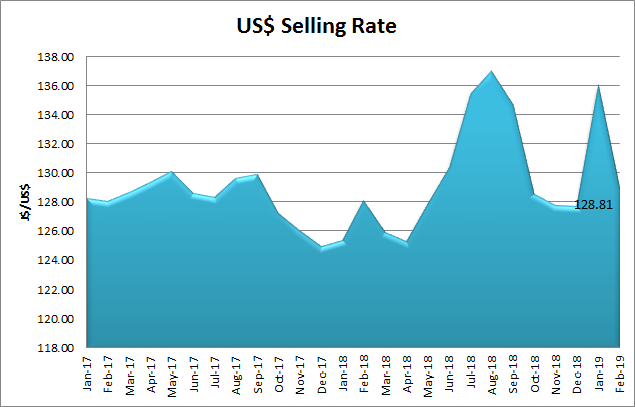 The Image shows indicative exchange rates for the last day of each month from January 2017 to February 2019. Click on the Image to enlarge. The US$ to J$ exchange rate is the most important exchange rate for Jamaican businesses and Jamaican people and the value of this exchange rate is always a need-to-know number in the fabric of our culture. The higher the value of the exchange rate, the cheaper our goods will be abroad, potentially enhancing our exports. Unfortunately, the higher value also means higher prices for all imported goods, which forms the basis for a high percentage of consumption in the nation. Water and Electricity rates are also indexed to the exchange rate so the higher the value the harder it is on consumers and producers. Please note the scale on the left hand side of the chart does not start at zero, this helps to magnify the changes in the exchange rate for the period.